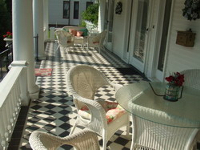 The Cool Breeze Veranda, with its pillars and inlaid tiled floor is a wonderful venue for a lazy afternoon; a quiet respite from a busy day touring the Evansville area. The best part of our day is joining our guests for a bountiful breakfast we serve family style. I came from a family of fine bakers. We try to make it different everyday with hot main dishes and meat, breads, coffee cakes, fruit as well as coffee, tea and juice. We can easily honor dietary needs. French mural wallpaper by the peerless wallpaper firm, Zuber & Cie., designed in 1834 (and chosen by Jacqueline Kennedy for the White House Diplomatic Reception Room), adorns the formal dining room. 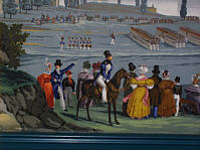 Manufactured using hand-blocked manufacturing methods, the mural is noted for its vibrant colors and striking detail, depicting scenes from the American colonization period. The large living room is an ideal place to relax on a comfortable english country sofa in front of an italian marble fireplace. Adjoining it is a library with a large collection to read and browse. 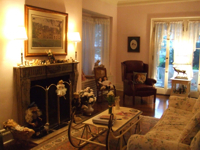 From the corner arrangements in our living room to the comfortable seatings, we want you to feel comfortable and relaxed.